Poor blind Brahman and his wife were dependent on their son for their subsistence. Every day the young fellow used to go out and get what he could by begging. This continued for some time, till at last he became quite tired of such a wretched life, and determined to go and try his luck in another country. He informed his wife of his intention, and ordered her to manage somehow or other for the old people during the few months that he would be absent. He begged her to be industrious, lest his parents should be angry and curse him. One morning he started with some food in a bundle and walked on day after day, till he reached the chief city of the neighbouring country. Here he went and sat down by a merchant's shop and asked alms. The merchant inquired whence he had come, why he had come, and what was his caste; to which he replied that he was a Brahman, and was wandering hither and thither begging a livelihood for himself and wife and parents. Moved with pity for the man, the merchant advised him to visit the kind and generous king of that country, and offered to accompany him to the court. Now at that time it happened that the king was seeking for a Brahman to look after a golden temple which he had just had built. His Majesty was very glad, therefore, when he saw the Brahman and heard that he was good and honest. He at once deputed him to the charge of this temple, and ordered fifty kharwars of rice and one hundred rupees to be paid to him every year as wages. Two months after this, the Brahman's wife, not having heard any news of her husband, left the house and went in quest of him. By a happy fate she arrived at the very place that he had reached, where she heard that every morning at the golden temple a golden rupee was given in the king's name to any beggar who chose to go for it. Accordingly, on the following morning she went to the place and met her husband. "Why have you come here?" he asked. "Why have you left my parents? Care you not whether they curse me and I die? Go back immediately, and await my return." "No, no," said the woman. "I cannot go back to starve and see your old father and mother die. There is not a grain of rice left in the house." "O Bhagawant!" exclaimed the Brahman. "Here, take this," he continued, scribbling a few lines on some paper, and then handing it to her, "and give it to the king. You will see that he will give you a lac of rupees for it." Thus saying he dismissed her, and the woman left. On this scrap of paper were written three pieces of advice—First, If a person is travelling and reaches any strange place at night, let him be careful where he puts up, and not close his eyes in sleep, lest he close them in death. Secondly, if a man has a married sister, and visits her in great pomp, she will receive him for the sake of what she can obtain from him; but if he comes to her in poverty, she will frown on him and disown him. Thirdly, if a man has to do any work, he must do it himself, and do it with might and without fear. On reaching her home the Brahmani told her parents of her meeting with her husband, and what a valuable piece of paper he had given her; but not liking to go before the king herself, she sent one of her relations. The king read the paper, and ordering the man to be flogged, dismissed him. 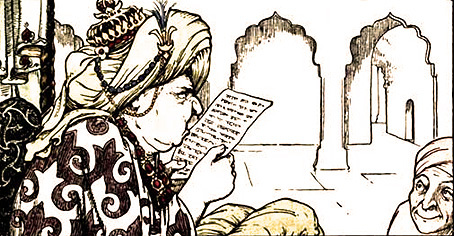 The next morning the Brahmani took the paper, and while she was going along the road to the darbar reading it, the king's son met her, and asked what she was reading, whereupon she replied that she held in her hands a paper containing certain bits of advice, for which she wanted a lac of rupees. The prince asked her to show it to him, and when he had read it gave her a parwana for the amount, and rode on. The poor Brahmani was very thankful. That day she lay in a great store of provisions, sufficient to last them all for a long time. In the evening the prince related to his father the meeting with the woman, and the purchase of the piece of paper. He thought his father would applaud the act. But it was not so. The king was angrier than before, and banished his son from the country. So the prince bade adieu to his mother and relations and friends, and rode off on his horse, whither he did not know. At nightfall he arrived at some place, where a man met him, and invited him to lodge at his house. The prince accepted the invitation, and was treated like a prince. Matting was spread for him to squat on, and the best provisions set before him. "Ah!" thought he, as he lay down to rest, "here is a case for the first piece of advice that the Brahmani gave me. I will not sleep to-night." It was well that he thus resolved, for in the middle of the night the man rose up, and taking a sword in his hand, rushed to the prince with the intention of killing him. But he rose up and spoke. "Do not slay me," he said. "What profit would you get from my death? If you killed me you would be sorry afterwards, like that man who killed his dog." "What man? What dog?" he asked. "I will tell you," said the prince, "if you will give me that sword." "Once upon a time there lived a wealthy merchant who had a pet dog. He was suddenly reduced to poverty, and had to part with his dog. He got a loan of five thousand rupees from a brother merchant, leaving the dog as a pledge, and with the money began business again. Not long after this the other merchant's shop was broken into by thieves and completely sacked. There was hardly ten rupees' worth left in the place. The faithful dog, however, knew what was going on, and went and followed the thieves, and saw where they deposited the things, and then returned. "In the morning there was great weeping and lamentation in the merchant's house when it was known what had happened. The merchant himself nearly went mad. Meanwhile the dog kept on running to the door, and pulling at his master's shirt and paijamas, as though wishing him to go outside. At last a friend suggested that, perhaps, the dog knew something of the whereabouts of the things, and advised the merchant to follow its leadings. The merchant consented, and went after the dog right up to the very place where the thieves had hidden the goods. Here the animal scraped and barked, and showed in various ways that the things were underneath. So the merchant and his friends dug about the place, and soon came upon all the stolen property. Nothing was missing. There was everything just as the thieves had taken them. "The merchant was very glad. On returning to his house, he at once sent the dog back to its old master with a letter rolled under the collar, wherein he had written about the sagacity of the beast, and begged his friend to forget the loan and to accept another five thousand rupees as a present. When this merchant saw his dog coming back again, he thought, 'Alas! my friend is wanting the money. How can I pay him? I have not had sufficient time to recover myself from my recent losses. I will slay the dog ere he reaches the threshold, and say that another must have slain it. Thus there will be an end of my debt No dog, no loan.' Accordingly he ran out and killed the poor dog, when the letter fell out of its collar. The merchant picked it up and read it. How great was his grief and disappointment when he knew the facts of the case! "Beware," continued the prince, "lest you do that which afterwards you would give your life not to have done." By the time the prince had concluded this story it was nearly morning, and he went away, after rewarding the man. The prince then visited the country belonging to his brother-in-law. He disguised himself as a jogi, and sitting down by a tree near the palace, pretended to be absorbed in worship. News of the man and of his wonderful piety reached the ears of the king. He felt interested in him, as his wife was very ill; and he had sought for hakims to cure her, but in vain. He thought that, perhaps, this holy man could do something for her. So he sent to him. But the jogi refused to tread the halls of a king, saying that his dwelling was the open air, and that if his Majesty wished to see him he must come himself and bring his wife to the place. Then the king took his wife and brought her to the jogi. The holy man bade her prostrate herself before him, and when she had remained in this position for about three hours, he told her to rise and go, for she was cured. In the evening there was great consternation in the palace, because the queen had lost her pearl rosary, and nobody knew anything about it. At length someone went to the jogi, and found it on the ground by the place where the queen had prostrated herself. When the king heard this he was very angry, and ordered the jogi to be executed. This stern order, however, was not carried out, as the prince bribed the men and escaped from the country. But he knew that the second bit of advice was true. Clad in his own clothes, the prince was walking along one day when he saw a potter crying and laughing alternately with his wife and children. "O fool," said he, "what is the matter? If you laugh, why do you weep? If you weep, why do you laugh?" "Do not bother me," said the potter. "What does it matter to you?" "Pardon me," said the prince, "but I should like to know the reason." "The reason is this, then," said the potter. "The king of this country has a daughter whom he is obliged to marry every day, because all her husbands die the first night of their stay with her. Nearly all the young men of the place have thus perished, and our son will be called on soon. We laugh at the absurdity of the thing—a potter's son marrying a princess, and we cry at the terrible consequence of the marriage. What can we do?" "Truly a matter for laughing and weeping. But weep no more," said the prince. "I will exchange places with your son, and will be married to the princess instead of him. Only give me suitable garments, and prepare me for the occasion." So the potter gave him beautiful raiment and ornaments, and the prince went to the palace. At night he was conducted to the apartment of the princess. "Dread hour!" thought he; "am I to die like the scores of young men before me?" He clenched his sword with firm grip, and lay down on his bed, intending to keep awake all the night and see what would happen. In the middle of the night he saw two Shahmars come out from the nostrils of the princess. They stole over towards him, intending to kill him, like the others who had been before him: but he was ready for them. He laid hold of his sword, and when the snakes reached his bed he struck at them and killed them. In the morning the king came as usual to inquire, and was surprised to hear his daughter and the prince talking gaily together. "Surely," said he, "this man must be her husband, as he only can live with her." "Where do you come from? Who are you?" asked the king, entering the room. "O king!" replied the prince, "I am the son of a king who rules over such-and-such a country." When he heard this the king was very glad, and bade the prince to abide in his palace, and appointed him his successor to the throne. The prince remained at the palace for more than a year, and then asked permission to visit his own country, which was granted. The king gave him elephants, horses, jewels, and abundance of money for the expenses of the way and as presents for his father, and the prince started. On the way he had to pass through the country belonging to his brother-in-law, whom we have already mentioned. Report of his arrival reached the ears of the king, who came with rope-tied hands and haltered neck to do him homage. He most humbly begged him to stay at his palace, and to accept what little hospitality could be provided. While the prince was staying at the palace he saw his sister, who greeted him with smiles and kisses. On leaving he told her how she and her husband had treated him at his first visit, and how he had escaped; and then gave them two elephants, two beautiful horses, fifteen soldiers, and ten lacs rupees' worth of jewels. Afterwards he went to his own home, and informed his mother and father of his arrival. Alas! his parents had both become blind from weeping about the loss of their son. "Let him come in," said the king, "and put his hands upon our eyes, and we shall see again." So the prince entered, and was most affectionately greeted by his old parents; and he laid his hands on their eyes, and they saw again. Then the prince told his father all that had happened to him, and how he had been saved several times by attending to the advice that he had purchased from the Brahmani. Whereupon the king expressed his sorrow for having sent him away, and all was joy and peace again.